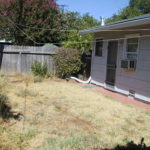 Let’s study the before picture…the yard is narrow and deep. 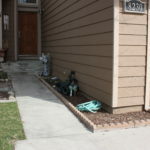 The door that you can see in the photo is a second unit. 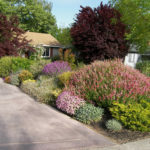 When I was asked to do a drought tolerant landscape design for this house (and granny unit), my client wanted something with color but was easy to maintain. She wanted to create a natural border between her and her rental unit. 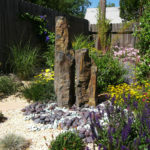 The focus from her living room became the Basalt fountain in the foreground. This type of fountain is my favorite…the water recirculates from a basin below ground, is covered by a screen, and cobbles hide the basin and pump. 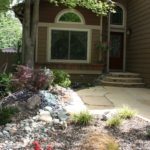 Whether you use drilled stones, pottery or build a natural waterfall, having a below-ground basin is much easier to maintain. Very little light penetrates to the water below, so growing algae is not a problem. Also, there is no standing water, which means that mosquitos are not a problem either! 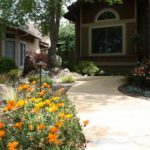 The top dressing, instead of bark, is a small type of crushed rock. 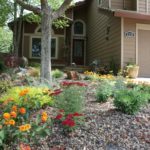 It sits on top of weed fabric, and the overall effect is not only clean looking, but the plant’s roots stay cool and moist in the soil, plus the rock can easily be blown with a blower to clean up fall leaves, without the stones blowing away too! Showing these pictures is like showing you a picture of myself when I first get out of bed…not pretty! This is what my garden looks like at the moment: it’s fall and we’re heading into winter. So what’s to do in the garden? There are two main pushes in the garden for me: Fall and Spring. It’s fall that I’d like to speak about now. 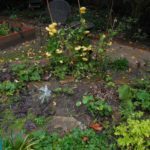 Preparing your garden for winter is like getting a child ready for bed. You make sure they are bathed, teeth brushed, pajamas on, and then the bedtime story and off to sleep. In the morning the hope is that they are refreshed and ready for the day. 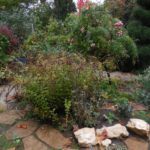 With the garden, there are many perennials that have blossomed and shined, and now have dried stalks and bases that need cutting back. Ornamental grasses will need hair cuts as well (make sure they are all straw-colored before you cut). 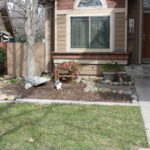 After you do the major pruning and cleaning (roses will wait until January for their cutting), I usually prune back shrubs that have grown too big. Next I deal with the weeds. 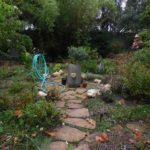 When everything is clean and cut, I spread mulch, and here I’m using the leaves that have fallen that I have shredded, to blanket the beds, and tuck everything in for a winter’s sleep. I know that by taking care of the garden like this, it will awaken again in the spring happy and healthy!